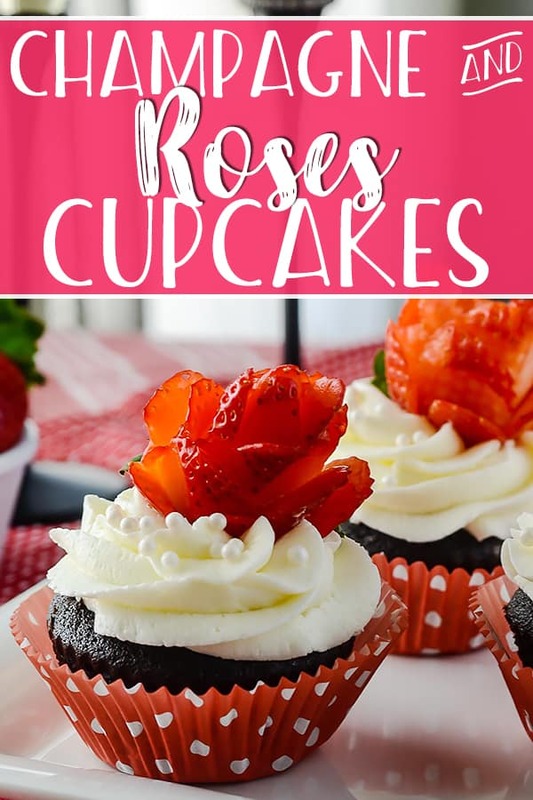 Valentine’s Day wrapped up in a sweet dessert: dark chocolate rose cupcakes, strawberries, and bubbly are what make these Champagne and Roses Cupcakes come to life! Have you ever wondered what love tastes like? No, that’s not a rhetorical question. And get your mind out of the gutter, too, I’m being serious! OK, maybe a rephrase; have you ever wondered what love on February 14th tastes like? Some of you may have different answers. Oysters. Surf & Turf. The special for two at your favorite romantic restaurant. A pint of Ben & Jerry’s and a chick flick. Personally, I’m partial to braised short ribs and red wine. However, I truly believe that Valentine’s Day can be summed up in four flavors (and smells): Chocolate, strawberry, rose, and champagne. Watch out, world. While experimenting, I put the flavors of love together, and managed to discover what might just be the ultimate Valentine’s Day treat for the one you love! I can’t decide how I truly feel about Valentine’s Day. A big part of me finds it annoying, since I work in food retail. The fact that people flock to spoil their husbands, wives, boyfriends, and girlfriends one special day a year? That’s something that you should do year round, right? Or am I crazy? Sure, you share kisses and an “I love you” here and there the rest of the year, but for some reason, thanks to the greeting card companies’ invented holiday, it’s almost a requirement that you buy overpriced flowers and cardboard hearts filled with surprise chocolates, and battle the rest of the country for dinner reservations. Am I wrong? Admit it. You scramble to do something extra special. I know I do. Which brings me to the other part of me, the hopeless romantic who loves all the hearts and flowers and craves some sort of special attention from my husband. The woman who, any other time of the year, says “no flowers, buy me something that lasts more than a week,” but for some reason, wants the most beautiful arrangement of roses imaginable. The sucker who came up with the idea for these very special Champagne and Roses Cupcakes, in honor of the stupid holiday. 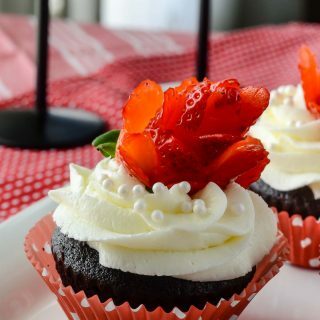 Making these chocolate rose cupcakes is so easy! I graciously accepted an offer to review The Simple Baker’s silicon baking liners, because I’ve been meaning to get a set anyway to see what they hype is all about, and they came in just in time for me to make these beauties with them. And let me tell you, they did not disappoint! The standard-sized liners come in a set of 24, in six lovely colors, and are a breeze to use. I washed them with warm, soapy water on a sponge before using them, and didn’t even have to spray them with any baking spray (which is usually recommended the first couple of uses with these types of liners). They’re sturdy enough that I was able to bake the whole batch of cupcakes on a cookie sheet instead of a muffin pan, and are super pliable, making removing the cupcakes so easy; they came out looking perfect! Washing the moist dark chocolate crumbs out of the bright-colored liners took no more than some more warm, soapy water on a sponge, and they looked brand new after some air drying. I’ll be completely happy using these little cuties for my cupcake (and any other creative) baking from now on! This year, Valentine’s Day will be much different for Mr. Crumby and I, since we will be spending it in one of the most historically romantic cities in the world – Rome. I’m thinking…a Vespa adventure for two, à la Roman Holiday (one of my favorite movies)? Mr. Crumby is no Gregory Peck, but I could totally pass for Audrey Hepburn…in the right light. Although, in 40 degree weather, a sundress and sandals are totally out of the question. Have I mentioned how excited I am to be going on this trip? I’ll be gushing about it plenty in the next couple of weeks, and then drowning you all in the hundreds of photos I’m inevitably going to end up taking. You know, this trip might actually make me like Valentine’s Day! Or at least appreciate what it stands for a little more. Maybe there should be a whole day devoted to the one you love. So you have an excuse to make them these. These champagne and roses cupcakes, guys. Let’s talk about their name. I don’t know if I’d go that far. But they were the most intriguingly delicious cupcakes I’ve ever made. I started by adapting one of the absolute best chocolate cupcake recipes I’ve ever come across to include an ingredient I’ve never used, but had a desire to add to my pantry: rose water. It’s a really versatile product, that is wonderful in Greek and Middle Eastern pastries like baklava and rice pudding. A fellow blogger used it in a cookie recipe she made for Christmas, and I’ve been dying to try it in something ever since. After looking through Pinterest for a while, I decided my cupcake flavor would be dark chocolate, even though it wasn’t a pairing that I found to be common. Everything else just kind of fell in to place from there during my shopping trip. Strawberry filling = a perfect match for chocolate, plus the berries were so beautifully ripe, they were almost screaming at me to take them home. As for the icing, I knew I wanted to go the Italian Meringue Buttercream route (another first for me), and the bottle of champagne that ended up taking part in this recipe almost literally fell in to my hands. The result ended up being a culinary win: beautiful in looks, smell, and taste. If you decide to make these beauties, let me just offer you a fair warning. 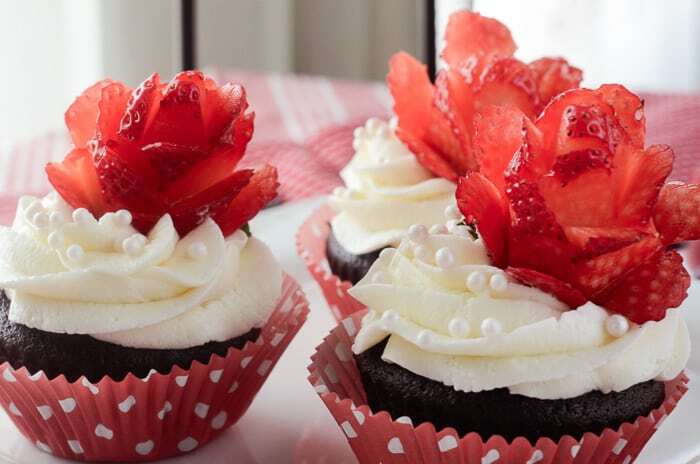 Don’t overdo it on the rose water in these chocolate rose cupcakes. Unless you like the taste of potpourri. Or rose flavored bath gel. It is literally made from rose petals fermented in a jar of water in the sun. Take it from me – I made this mistake on my first batch. 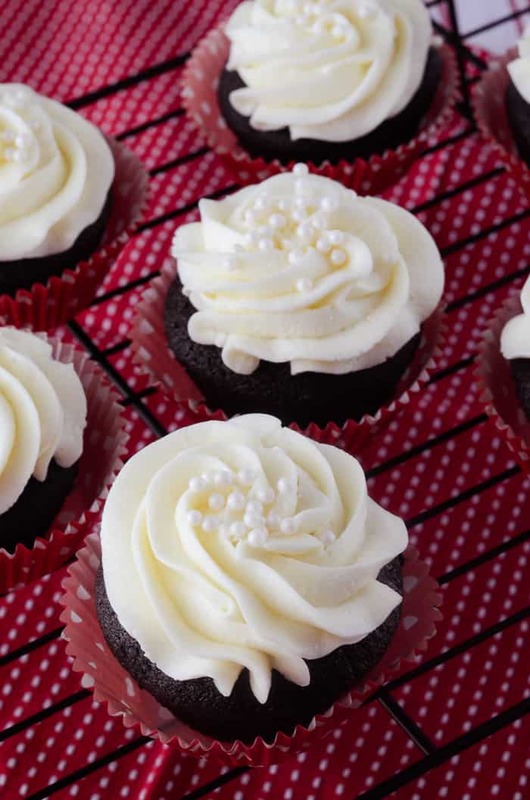 If the rose smell is very prevalent in your cupcake batter, you’ve gone too far! Love these Champagne & Roses Cupcakes? Your Valentine will adore these sweet desserts, too! 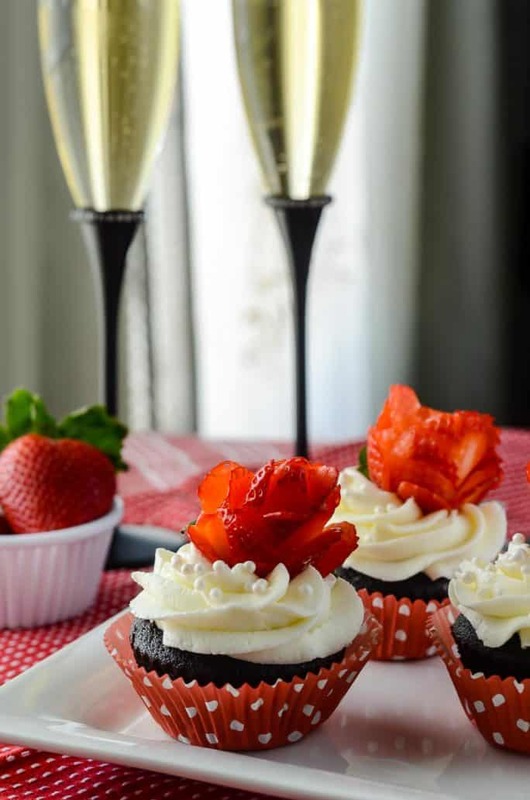 Valentine's Day wrapped up in a sweet dessert: dark chocolate rose cupcakes, strawberries, and bubbly are what make these Champagne and Roses Cupcakes come to life! Place strawberries in a small saucepan over medium heat. Stir constantly to allow the strawberry juices to release (about 4-5 minutes), then add the sugar and cornstarch/water. Stir an additional 3-4 minutes until mixture thicken slightly. Preheat oven to 350 degrees F. Line muffin tin with cupcake liners. In the bowl of a stand mixer fitted with a paddle, beat butter and sugar until fully combined. Add chocolate to a small bowl and melt in 30 second bursts in the microwave. When the melted chocolate is cool to the touch, add it to the butter mixture; mix until just combined. Add in eggs and egg yolks one at a time, until just combined. Mix in oil, vanilla, rose water, and sour cream/Greek yogurt until just combined. In a medium bowl, add flour, salt, baking soda, cocoa and espresso powder, and whisk to combine. Add flour mixture to wet ingredients in three additions, mixing until just combined with each addition. Mix in water until just combined, being sure not to overmix. Fill cupcake liners ⅔ full and put in the oven, dropping the temperature to 325 degrees F after closing the oven door. 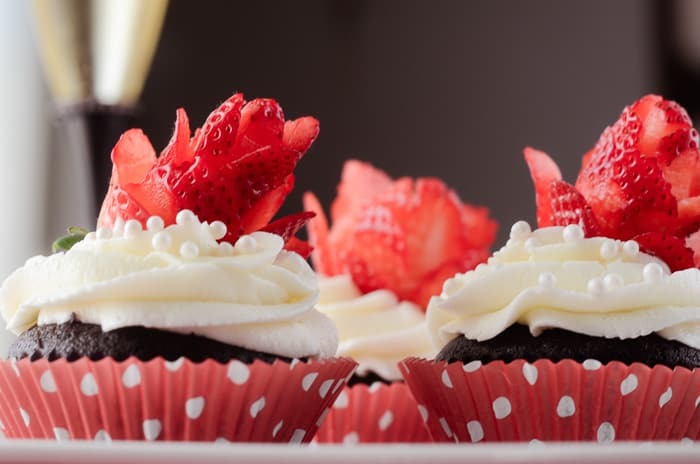 Check at 20 minutes using a toothpick inserted into the center of a cupcake. If it doesn't come out clean, check back at 22 minutes. 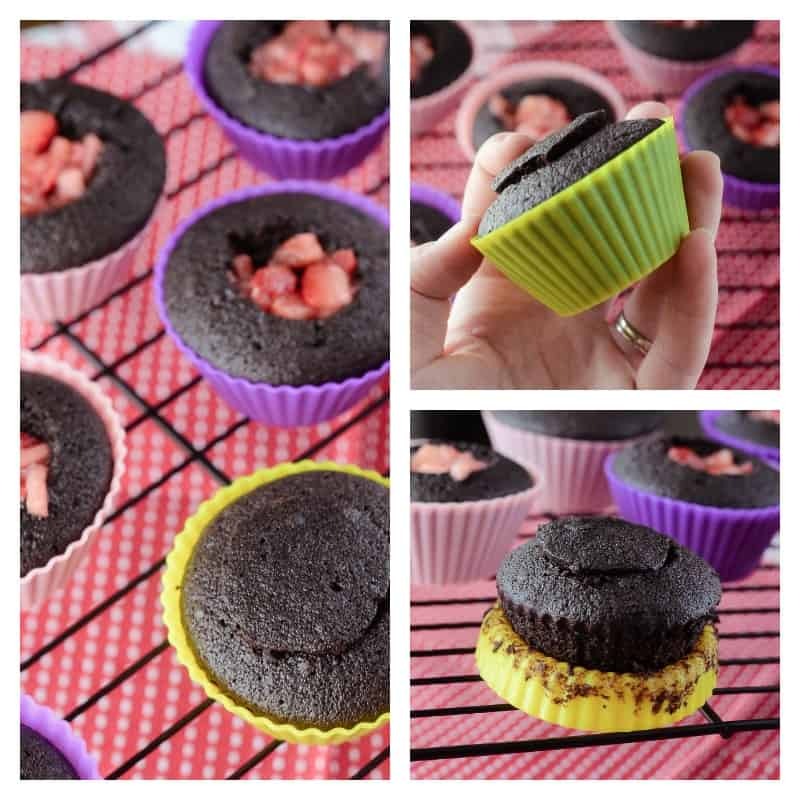 Immediately remove cupcakes from the muffin tin and place on a cooling rack to cool to room temperature. 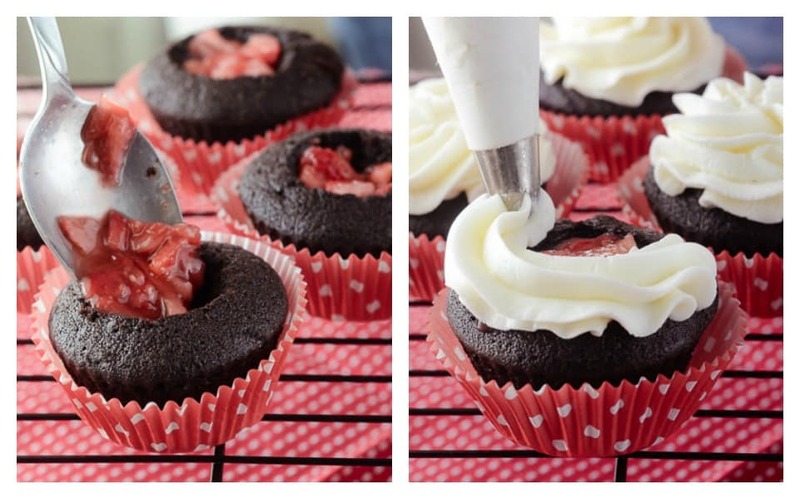 Cut a 1x1 inch hole in each cupcake, and spoon the cooled strawberry filling in each one. Make a batch of Italian Meringue Buttercream, replacing the 1 teaspoon of vanilla extract the original recipe calls for for champagne. 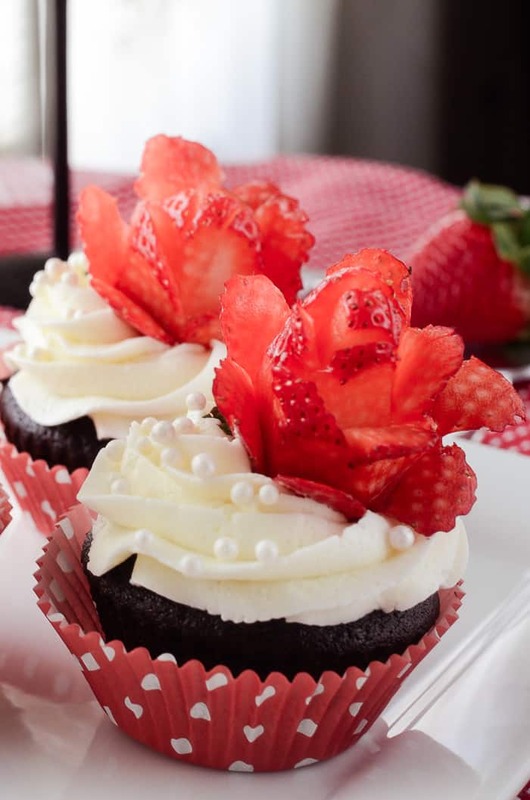 Pipe buttercream on cupcakes as desired and garnish with Strawberry Roses. Cupcake recipe adapted from Cupcake Project. Icing recipe adapted from Whisk-Kid. 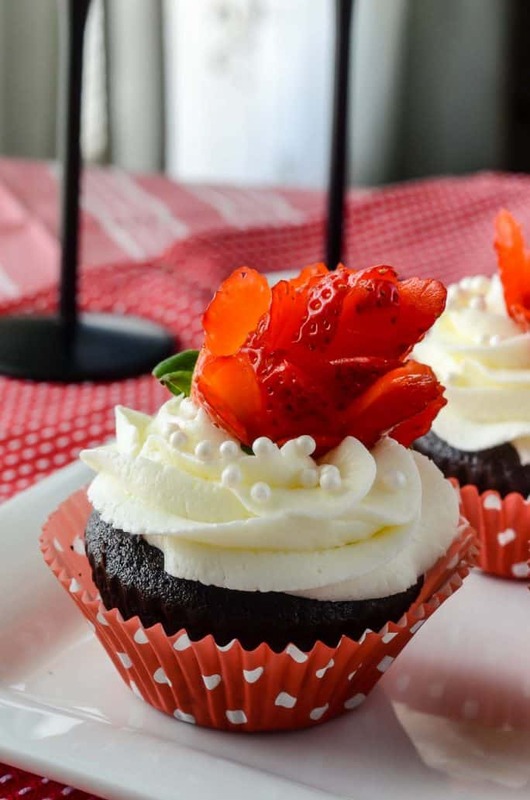 PIN THESE CHOCOLATE ROSE CUPCAKES FOR LATER! 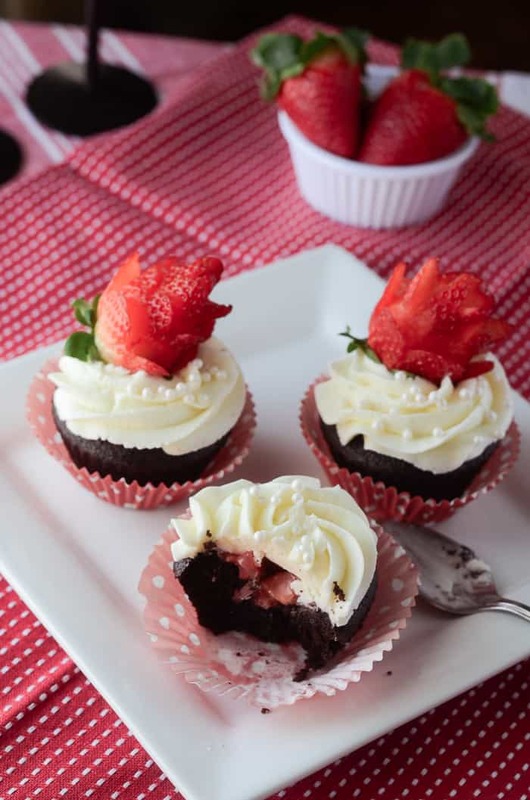 The recipe for the cupcake and icing looks divine, but I am in love with what you did with the strawberries. They are gorgeous and love that it is an all natural adornment! Enjoy your trip to Rome, sounds romantic and super fun! 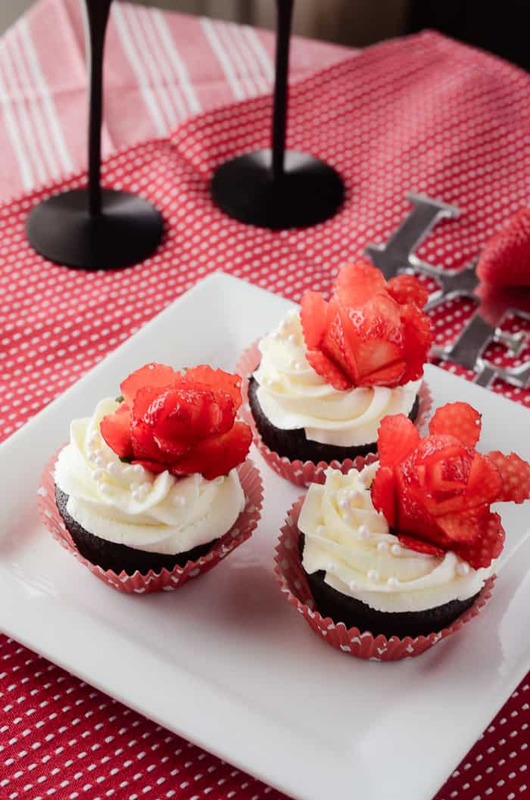 Meanwhile we would love to make these delicious cupcakes which have captured all the nuances of Valentine’s Day! They look scrumptious! Oh my goodness,I think I will be making this for my daughter’s birthday that is in the end of February. She requested strawberries. Your cupcakes look wonderful! I love that they are stuffing with the strawberry mixture! I am definitely going to have to try these! These are so beautiful and look delicious!I almost wouldn’t want to mess them up! Wow, not only do these cupcakes look beautiful, I’m sure they are delicious! What a beautiful addition to a Valentine’s meal! Your cupcakes are almost too beautiful to eat – almost! Those strawberry roses are amazing!! Have a great vacay in Rome! I’m looking forward to seeing lots of pics on your blog when you return. Safe travels! These are some beautiful cupcakes. I just want to stare at them and not eat them. You did a phenomenal job with these. I love the touch of the strawberry at the center. YUM! These look amazing! Have fun in Rome- I have always wanted to go there! Oooh, I want one of these RIGHT NOW. Last year, Andrew got me Gigi’s cupcakes for Valentine’s Day. It would be fun to make our own this year! What a great cupcake combo! Perfect for Valentine’s! Aren’t these cupcakes just great? Your frosting looks so divine and your cupcakes are so artsy. Very lovely to look and absolutely delicious to eat. I am so loving this!